174 pages | 27 B/W Illus. The Belt and Road Initiative (hereafter BRI) of China has attracted worldwide attention and participation, causing a lot of debate over its implications for international society. Although it is still in a budding stage, the BRI seems to afford a framework for an increasing number of countries to explore jointly new international economic governance mechanisms and offer significant opportunities for them to cope jointly with global challenges. Taking a globalization perspective and tracking the ancient silk roads, this book tries to examine the general context in which the BRI is raised and implemented, arguing that this Chinese initiative, instead of replacing existing international cooperation mechanisms, is a call for the reform and development of neoliberal globalization and will open up a new era of inclusive globalization. Inclusive globalization is neither an overturning nor a simple continuation of neoliberal globalization but rather a proposal capable of addressing the problems of existing globalization. The difference between them lies in the fact that globalization cannot only serve the "spatial fix" of capital but also has to meet the needs of living people. 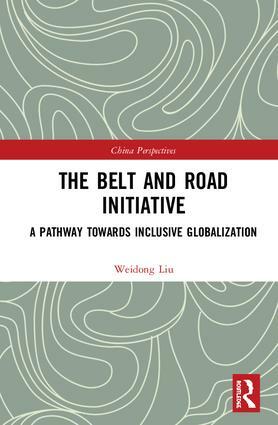 The book also addresses a number of major issues on building the Belt and Road and contains Chinese media’s interviews with the author on various BRI issues. Given the author has been intensively involved in the study of and planning for the BRI, the book offers a valuable academic insight into this Chinese initiative. Weidong Liu is a professor in Economic Geography at the Institute of Geographical Sciences and Natural Resources Research, Chinese Academy of Sciences. His research interests include regional development and regional policy, foreign direct investment (FDI), multinational corporations (MNCs), Global Production Network (GPN), the automobile industry, and the Belt and Road Initiative of China. His previous publications include The Geographical Transformation of China (Routledge, 2015). This is the first time that any of these books have been translated into English for international readers. The series aims to put forward a Chinese perspective, give insights into cutting-edge academic thinking in China, and inspire researchers globally.